It can take your breath away. Thousands pay for the chance. And this summer, boaters on Long Island Sound had many opportunities to see breaching whales up close, sometimes within 300 feet. Thanks to the efforts of Save the Sound and other organizations, sights like this breaching humpback whale may become common on the waters of Long Island Sound. Why do these magnificent animals come into the Sound? It can be tempting to see their presence as a sign of improving water quality. In truth, water quality varies hugely around the Sound, with many areas – particularly in the western Sound and in bays and harbors all around the Sound – still badly affected by low-oxygen dead zones and high bacteria levels. And while clean, well-oxygenated water can’t hurt, big marine mammals like this are less immediately affected by those conditions than animals that must get their oxygen from the water and that can’t move fast enough to escape low-oxygen areas. So if not pristine waters, what is it that’s luring these creatures? FOOD! They’re chasing big schools of prey fish. Silver-and-yellow Atlantic menhaden (often called “bunker”) form schools by the thousands. 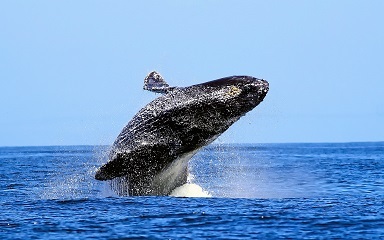 They are a favorite target for dolphin, porpoise, and humpbacks. And fortunately, schools of bunker are on the rise—in part due to our work. Three years ago, Save the Sound helped organize a dozen Long Island Sound groups, calling for a historic cap on menhaden harvest. We joined our collective voices with more than 100 other advocates up and down the East Coast, and the mid-Atlantic and north Atlantic fisheries councils listened. They passed a cap on menhaden catch designed to prevent industrial fisheries from overfishing this crucial species, so the population can start to rebuild to the incredible, pre-industrial abundance that early European settlers recorded. While this rule still needs to be strengthened, the Pew Environment Group (who headed up the effort) estimates that due to this cap there are 300 million more of these creatures in the Atlantic today than there were just three years ago. This means more meals for the fish we eat, like tuna, but also more food for whales, dolphins, and other big mammals. Last summer, big schools of menhaden attracted whale-feeding parties off of New Jersey’s coast in numbers rarely seen. The beginning of a return of menhaden is a solid start for the wide array of finned, feathered, and blubbery creatures that feed on all life stages of menhaden. Menhaden are filter feeders, eating low in the food web with a diet comprised of plankton. Menhaden, and other forage fish such as herring, are primary consumers that become food sources for many marine animals in the Sound. All of which, from the plankton to the large marine mammal, make up the biologically diverse estuary we all share in our backyards. And it’s not just mammals that benefit from large forage fish populations. Terns and herons spend the late summer and early fall bulking up for their fall migration. As I write this, they are congregating along our coast and gorging on schools of the inch-long baby menhaden, or “pea bunker,” that hatched earlier this summer. From the bottom of the food web to the top predators, abundance is key. With luck—and good conservation practices—we’ll be able to look forward to many more whale sightings in the future. But do exercise caution. This summer, a pair of kayakers got a much closer-than-planned view of these enormous creatures when a humpback breached and came down on top of the boat, sucking its occupants under water. The kayakers got the view of a lifetime, but it could have ended in tragedy for both paddlers and whale. Humpback whales are endangered, and all whales, dolphins, and porpoise are protected by the Marine Mammal Protection Act. Should you encounter a humpback whale or other large mammal, for your safety and theirs, cut your engine and stay at least 100 yards away. Porpoise, dolphin, and humpbacks are awe-inspiring signs of hope for a return of abundant life to Long Island Sound. On one hand they may be an indication of growing annual populations and seasonal survival rates of prey sources like menhaden that are integral to a healthy Sound ecosystem…and on the other hand, they are a simple and unforgettable joy to witness in the wild.